Latest Bridal Gown In Jack Sullivan Design. This next collection that I will be giving a sneak peek to has been inspired by some new laces I have had made. So SOOO pretty! The gowns were gorgeous and I only wish that there were that many beautiful designs to choose from back when I was bridal gown hunting. Jack has not only just launched his Winter 2013 Collection, but has been accepted to take part in the Bridal category at this year’s Mercedes Benz Fashion Week. This collection will suit most brides, due to the varying silhouettes and fabrics used. Jack has been holding Designer Days around the country, and I was lucky enough to meet the man himself at his recent Designer Day in Brisbane. Last Saturday I had the pleasure of meeting Jack Sullivan from Jack Sullivan Bridal, and getting behind the scenes of his new Winter 2013 Collection. “I have been blown away with the response to my latest collection, a few of the most popular gowns were actually inspired by gowns that I did for a competition last year. Some gowns are very bold with layering of heavily beaded lace and full Skirts, whilst other gowns have very little detailing apart from a few Swarovski crystals and soft flowing skirts. 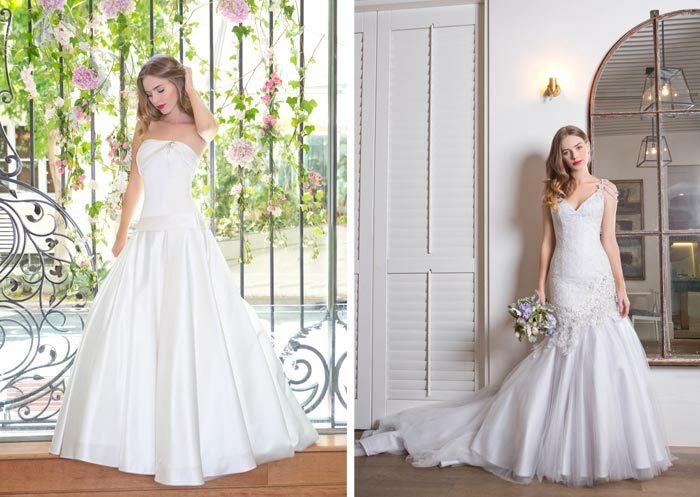 Each gown is available in different colors to suit brides.